In March, I found out I was the recipient of the 2016-17 Fiction Thesis Fellowship at George Mason. This fellowship covers my tuition and provides a stipend so that I can work on my thesis during my final year without distractions or limitations. It’s an honor—absolutely—but the process of applying for it is what truly made my thesis/this novel seem concrete and tangible. For the first time since I’d started drafting pages for this book, I was forced to describe the book as a whole, not just an assortment of scenes. Whose story was this? What was the world? Was there a main character? I had the what, the where, the when, but I struggled is identifying whose story this belonged to. I was in two writing-intensive course at the time, and produced around 70 pages over the course of the semester. Doing so, I noticed a trend—my audience was attracted to Althea, seemingly more than anyone (though shout out to the classmate who liked Mack the most.) Althea hadn’t made a single appearance on the page outside of a hazy memory from Ritchie’s youth, yet conversation in workshop would always gravitate to her. And in a one on one conference with my professor at the end of the semester, she asked: is this Ritchie’s story? Or is it Althea’s? Frankly, I didn’t know then and I still question it now—sometimes, Althea comes barrelling so forcefully to the forefront that I wonder if it’s her story or not. So far, she only has one chapter from her point-of-view and is in two scenes with characters, maybe 25 pages total, uut of 175 pages! She’s rarely “on screen”, yet time and again, my questions as an author come back to her. 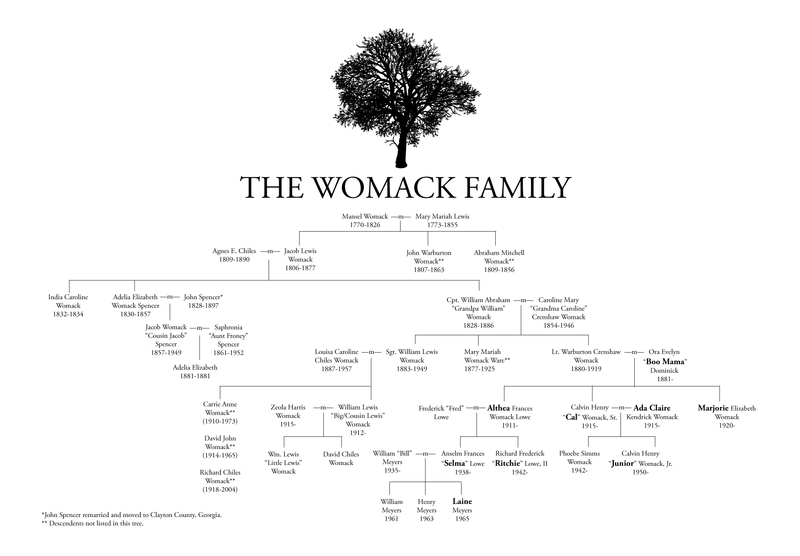 The Womacks are loosely based on my maternal family, specifically, my grandparents and great grandparents who lived side by side on the family farm, neighboring other cousins and family and their farms, all of our family and ancestors living on the same sprawl of land for the last two hundred years. Althea is a character based on my great aunt, Clara, which you might have gathered from the About page. I do not have concrete memories of Clara, who was born in 1912 and died in 1991, when I was about nine. What I remember of her is vague, and influenced by my current knowledge and family lore. I have a fuzzy memory that I think is solely mine, where I’m standing in the front room of my great grandmother’s house—the parlor and Clara’s bedroom—with sunlight streaming in from the western windows, haloing her so that she is only a silohuette. The rest is a flash of images—Paddington Bear, dust motes, the color grey and maybe blue. I don’t know what her face looked like, but the memory is the starting knot for my threads of of liking Paddington Bear, and love for old books, and fascination with this house—This moment/memory could possibly be where I received my first Paddington Bear toy or book. I know she loved the bear from darkest Peru, and I know I grew up doing the same, and I think my mother told me my old Paddington Bear toy came from Clara. The second memory I have of Clara doesn’t contain her directly, but I feel certain is also solely based on my own memory and not outside influences. My grandfather, Mac, built his house next door to his mother, Mattie, who everyone called Mamee. Mac and Clara were siblings. When Mac built his house in the 40s, he installed a Magneto phone. By the time I came along, it only ran two ways: to his mother’s house, and from her house to his. It was still functioning when I was a kid, and my younger brother Tom and I got yelled at for cranking the phone and making it ring in the hourse next door—where Clara lived. Clara was old (and I’m not sure if this was before or after her stroke) and the ringing made her yell—it’d likely make me yell, too. I’ve written this phone into stories long before my thesis, obsessed with its seemingly mystic qualities and its limitations. It only did one thing, and I loved using it for that one thing. No one ever picked up, but there was magic in the fact that something so old and so sole of purpose could be mine to control. I could be wrong, as is the case with all memory, but that is the beginning and end of my personal knowledge of Clara. The rest is a smattering of other people’s influence. She was a writer, the mother my two of my favorite cousins, lived in Mamee’s house (my great-grandmother) until she died, and loved to read. I am fascinated by her but didn’t really know her, nor do I remember her. (The same can be said about my own grandparents, but that’s another post.) But Clara influenced Althea—both from a sense of wanting to get to know her better, and from a sense of wanting to understand a close kin creative writer. This novel isn’t the True Life/Biopic about Clara, or my family, but it’s my attempt at understanding these types of people who lived in a time and a place that calls to me. I feel like Althea could represent many women at this time—women who struggled with career/creative endeavors and family, women who struggled with manic depression. And to be frank, I know why my classmates are fascinated by Althea (and by proxy, my great aunt)—she set off for New York to be a writer, leaving behind her home, her family, and her comfort zone at a time when that wasn’t really “done.” Then, she died surrounded by her books and her records, living in her parents’ front parlor, agoraphobic and isolated. How did A get to B? How did Althea end up this way? This is my fictional imagining of how something like this could happen, my understanding of how a close family, who live in houses side by side, ends up scattered, and their houses end up sitting empty and uninhabited. Or, how I explained it to my mother: this isn’t a perfect, life-like oil painting of our family. It’s abstract impressionism. I want the reader to feel the idea of these people in my family tree without actually knowing the play-by-play minutiae of their lives.